Mt. Chiiwa (乳岩山) is one of the popular travel spot in Shinshiro. 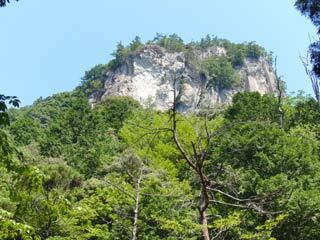 It is a 670m rock mountain, and chosen as the nature monument of Japan and the view of Japan. There is a huge crack which makes a huge tunnel, called "Tsuutendo," the Tunnel of Heaven's Pass. You can access to the upper level of the mountain and it offers you the great view of Shinshiro. There is also a huge cave in the middle of the cliff. To travel this mountain takes 30 min. Tsuutendo - the tunnel with steps to the upper level. Chiiwadokutsu - the cave of Chiiwa. Chiiwa literary means rock of breast, because the rock in the cave looks like women's breast.